Cats Can Eat Healthy, too! Though Nick and I don’t have any human children yet, we do have two very furry ones. I’ve mentioned them a few times on blog, and if you follow me on Instagram then you’ve definitely seen your fair share of them. Kaiser is our furry pooch, and Cali is our little feline princess. Today cats rule and dogs drool, so we’re talking all about Cali. We adopted Cali 4 years ago when we lived in Oklahoma. We broke her outta jail! 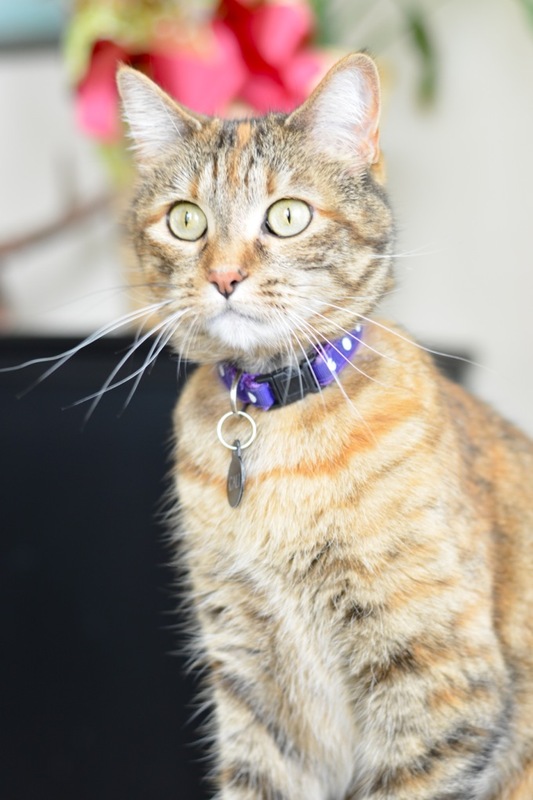 Though Cali is her official name, she goes by many names in our household including Snuggler, Snugz and Orangecat. Some of her favorite activities include sleeping, eating, antagonizing the dog, sleeping, doing crazy ninja moves off the hallway walls… did I mention sleeping? She is also always begging to go outside. She even reaches up to the door handle to try to open it herself. 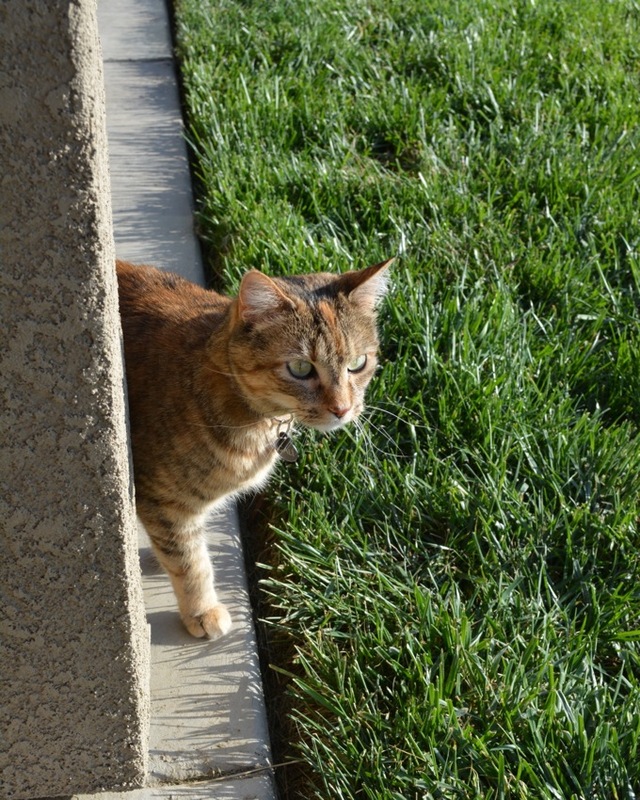 She has always been an indoor cat, but now that we have a fenced-in yard I let her out every once in a while (she’s a scaredy and has never shown any interest in trying to scale the fence). She loves it! Chasing bugs and hunting leaves. Cali enjoys my gardening as much as I do. 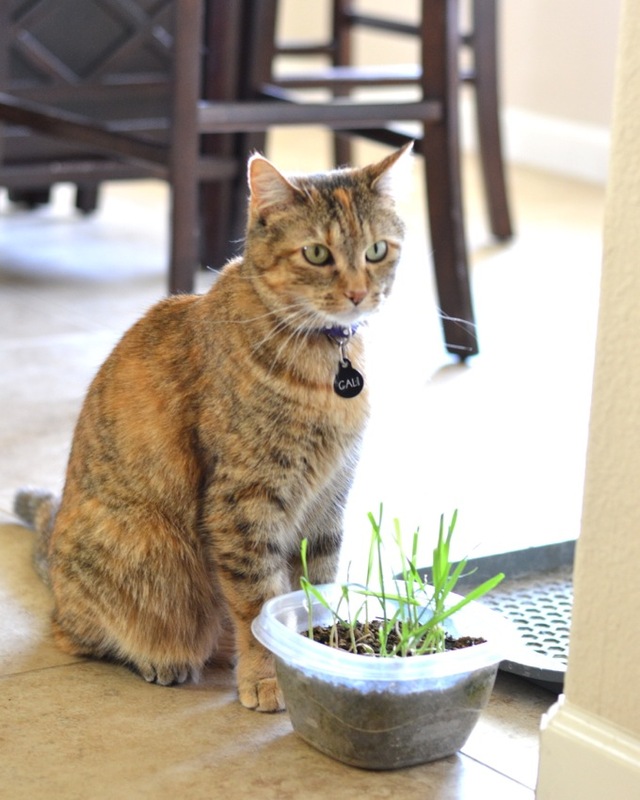 I planted her some cat grass and she’s totally been digging it. 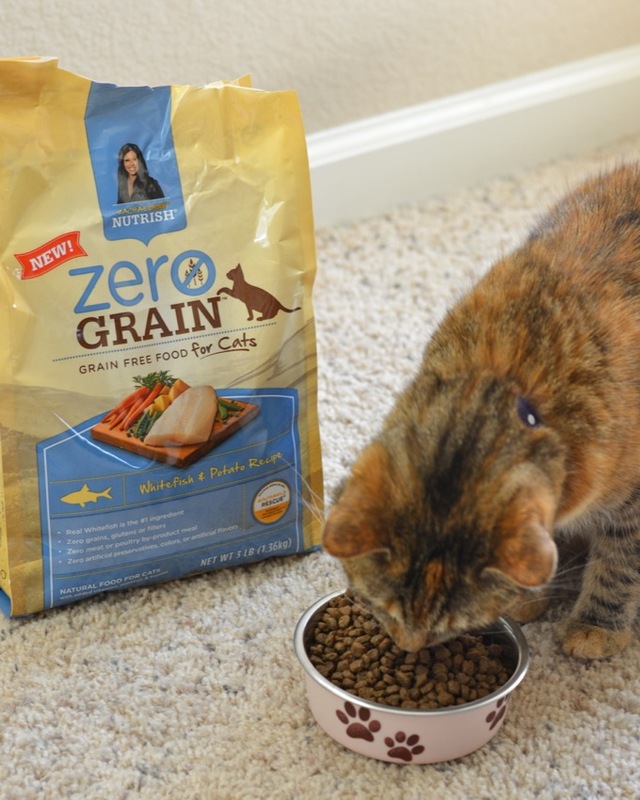 We recently had the opportunity to try Rachael Ray’s Nutrish Zero Grain Whitefish & Potato cat food. I’ve been a Rachael Ray fan for a long time. Her cooking shows were some of the first I ever watched and definitely helped to spark my interest in cooking. So I was really excited to see that she’s branching out into creating food for our furry friends. Cali was really excited to get a package of her own in the mail. She had to give the contents a thorough sniff-down. Yum, that smells good! After playing with and destroying the toy (also one of her favorite pastimes), she was ready to dig into the food. In 2007, with help from pet nutrition experts, Rachael created Nutrish ultra-premium food and treats for dogs. 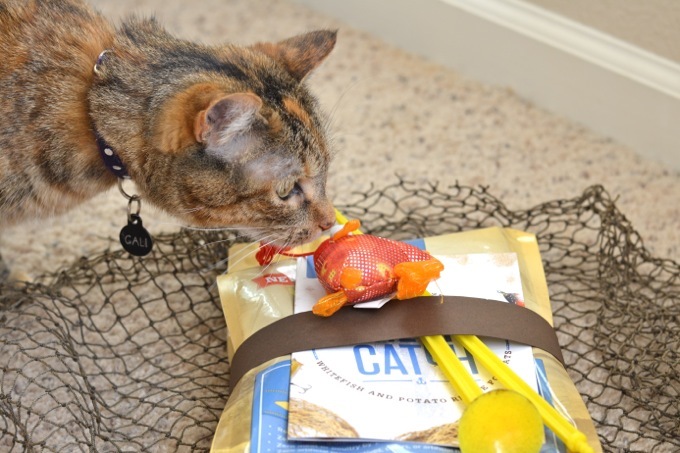 In 2014, she moved into the world of cat food. All recipes were inspired by Rachael’s kitchen! Nutrish recipes are made with simple, natural ingredients, zero artificial preservatives, colors or flavors, and do not contain meat or poultry by-product meal or fillers. Real whitefish is the #1 ingredient in the cat food we tried, a tasty and highly digestible protein that helps to maintain strong muscles and helps minimize litter box odors. We switched Cali over to the Nutrish food slowly, mixing it with her old food so that her stomach could adjust. She loved the Whitefish & Potato flavors, and I’m happy to know there are no weird ingredients in her food. Now she’ll have lots of great energy for her nighttime ninja antics! Keeping your furry friends healthy and happy is really important. We always make sure Cali is eating good quality food, that she gets lots of exercise and playtime, and of course, lots of love. Do you want to try Rachael Ray Nutrish!? You can get a $3 off coupon for Zero Grain Whitefish & Potato Recipe here. Nutrish is available in your local grocery store, as well as mass retailers like Target, Walmart and Amazon. And to stay up to date with Rachael Ray Nutrish, be sure to follow on Twitter, Facebook and Instagram (hello, tons of cute pets)! What do you do to keep your pets healthy? Do your cats like sleeping as much as mine?! My Office Makeover - Where the Magic Happens! Your little fur babies are so cute! I actually really like Rachael Ray pet food. I get her dog food for my dogs and they love it! Feel you on the “no human children, but a few furry ones” ;). My husband and I have a German Shepherd-Lab Mix and he is totally our child. We are kiiiiiind of obsessed. LOL! Yes, they are way too spoiled! Your cat is SOOOO cute, Jess, and I totally believe in feeding your pet right! Pets are like family, and we need to feed them well, too! Thanks, Marcie!! 🙂 She’s pretty much my child, LOL! Your cat is too cute, Jess! I love the pictures you took! And I totally agree about pets eating healthy. It’s definitely worth it!